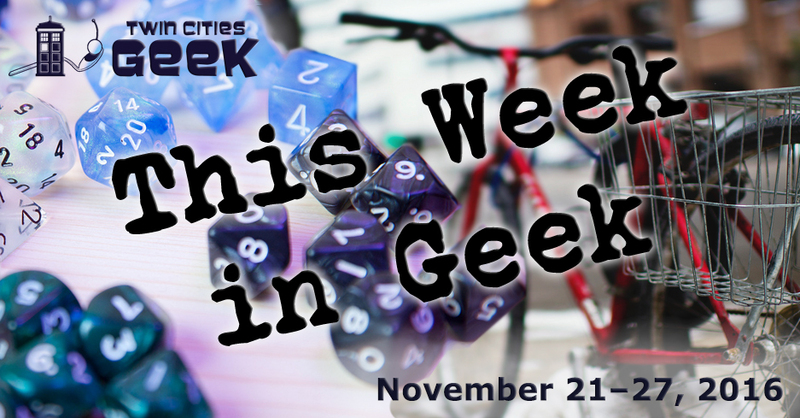 Welcome to This Week in Geek, your guide to events of interest to the Minnesota geek community for the week of Monday, November 21st through Sunday, November 27th. When: Monday, November 21st at 6:30 p.m. When: Tuesday, November 22nd at 7:00 p.m.
Geek Date Night is hosting a screening of Grosse Point Blank at Clubhouse Jäger. Compete in premovie trivia with Rob Callahan at 7:00 for a chance to win a $50 bar tab, then stay at 9:00 for a screening of the ultimate in ’80s nostalgia action thrillers: Grosse Pointe Blank! Come and experience YogaQuest, a blend of yoga and fanfiction storytelling led by certified yoga instructors. Experience a yoga workout experience and a story at the same time. This week’s focus is Steven Universe. When: Wednesday, November 16th at 7:00 p.m.
Stay focused and grounded in order to handle holiday stress. This is the second in YogaQuest’s Elf-Care: Self-Care Boot Camp for the Holidays series, a six-class series aimed at keeping you healthy during the holidays. When: Thursday, November 24 at 6:30 p.m.
Take part in the Bell Museum’s “garage sale,” where you find exciting ephemera like exhibit posters, craft supplies, books, overstock merchandise, and decorations. The sale runs 9:00 a.m to 5:00 p.m. on Friday; 10:00 a.m. to 5:00 p.m. on Saturday; and 12:00 p.m. to 5:00 p.m. on Sunday. When: Friday, November 25th at 8:30 p.m. When: Saturday, November 26th at 10:00 p.m. When: Saturday, November 26th at 11:45 p.m. When: Saturday, November 26th at 8:00 a.m.
Ásfólk Viking martial-arts group is hosting one-on-one or one-on-two training sessions tailored to individual needs, which can cover a variety of viking weapons and shield use, including spears, axes and swords. This 45-minute session costs $50, and participants must sign a liability waiver. As of this writing, the location hasn’t been finalized yet, so keep an eye on the Facebook event page. When: Saturday, November 26th at 1:00 p.m. The Black Hat Collective is a Twin Cities–based group of comic creators that meets quarterly on the fourth Saturday of the month in February, May, August, and November. This is an 18+ meetup due to potential adult themes. The Black Hat Collective aims to produce weird little comics and provide constructive critique to members. When: Sunday, November 27th at 12:45 p.m. When: Sunday, November 27th at 1:45 p.m.